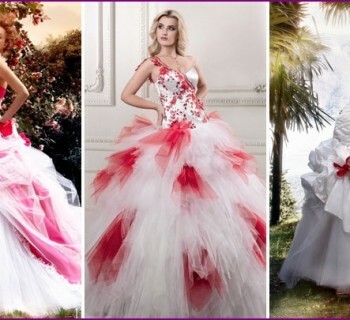 More and more brides are abandoning traditionalbridal white dresses and opt for a wedding dress of red, pink, blue and other colors. 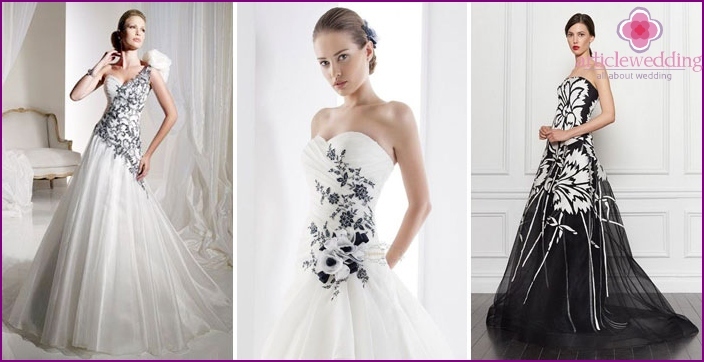 The black color in wedding dresses - a new fashion trend. Particularly impressive this shade blends in the form of a bride in white palette. Black and white wedding dress looks aristocratic and visually makes women slimmer figure. Contrasting colors are ideal for creating an image of the bride. 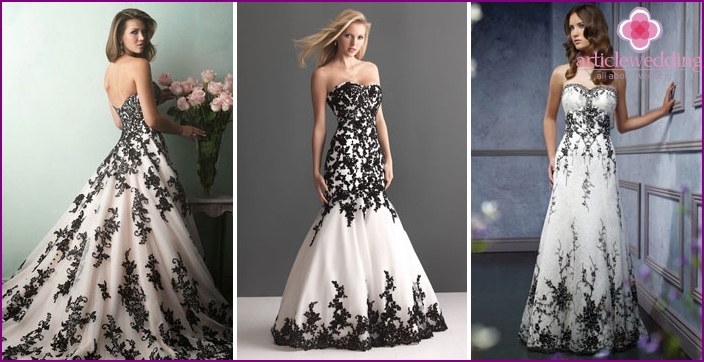 What are the patterns of black and white wedding dresses? For brides with pear-shaped figure such as a combination of the black color of the skirt and the white top of the bezel or on the hips make image of the girl more harmonious, beautiful. For brides who have a hip upper body, the ideal option would be to wear with dark elements on the top and white skirt. Girls with broad shoulders, you can visually correct shape, wearing the cloak of the black shade that will blend in with the color of festive clothing. To look more elegant curvy shape, you need to pick a style with a predominance of dark color on it. Blonde girl with white skin effectivelywill look in the wedding dress bodice with a light and a dark bottom. And white corset can accessorize shade night. For example, put on the black-colored gloves and belt. Bride with dark skin and dark hair suit combination of black top - light bottom. Fashion Accessories is a bright belt for the dress. Satin ribbon around the waist of the black color on the background of monochromatic or two-color material creates a nice accent in the image of the bride and waist emphasizes the benefit of women. The contrasting colors of the white dress and the color of the night will make the image of beauty belt going down the aisle, spectacular. Bright belt goes well with any wedding shaped models. This accessory is able to make a woman of refined, elegant. Black embroidery on white material lookssumptuously. Patterns can decorate the top of the corset waist region, the hem of the skirt or in different quantities to be present over the entire surface of wedding models. The game of contrasting colors captivates and fascinates with its beauty. Lace detail on a white corset top and skirt effectively emphasize the wonderful figure of a young woman. night color lace on light fabric gives the dress a sophisticated look. 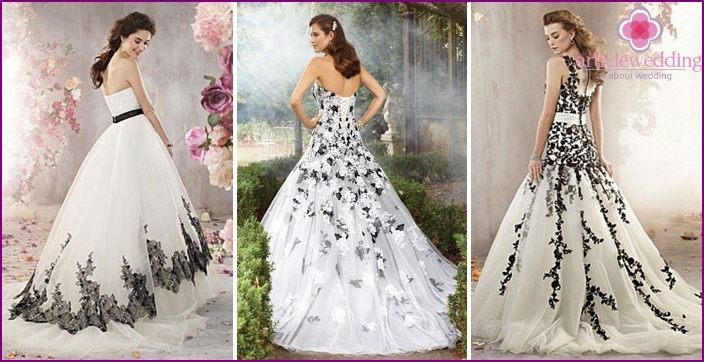 Black floral print on a white weddingDress suitable for the romantic image of the girl. Patterns buds can decorate a corset, skirt or unevenly distributed throughout the garment. The contrast of white and dark color gives the image of a newlywed special solemnity and beauty. Brown flowers on the corset effectively accentuate the waist and vertical patterns of buds on the skirt will make a graceful figure. Large dark print on the hem of the dress the brideIt looks bright, original. Unusually, fashionable look floral appliques dark shade on light wedding decoration. Greek style models and A-silhouettes, decorated with elements of contrast with a white shade, perfect for the stylish and bold girls. They look good accessories with flowers dark shade. Wedding dress with flounces help hidefull hips and accentuate the slender waist. Ruched at the wedding dress will bring a touch of romance to the image of women. Depending on the material and cut processing method, the shuttle can puff up or to flow smoothly. The edges of frills with black trim look impressive in combination with the white dress. A special feminine way of the bride givedress with a skirt that completely consists of many tiers of lush, white flounces with dark trim. In this case, in the form of lightheadedness that give ruffles, repaid a black satin stripe along their edges. The girl will look at this model, sublime, solemn. No less impressive looks like a combination of a small number of white frills on the black clothes of the bride. Wedding clothes with a predominance of dark shade looks elegant and aristocratic. Wedding in black and white dress with drawings andpatterns - a variety of fashionable, extravagant girls. Print can decorate the entire surface or focus in one part of the garment (at the waist, skirt, corset). 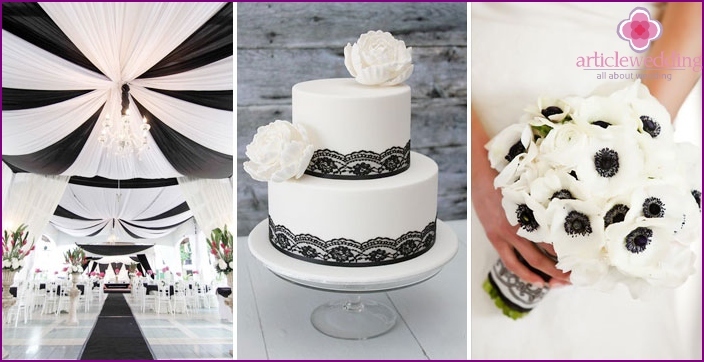 Geometric figures, abstraction, or even photos of famous people can decorate a black and white wedding dress. Bride in the clothes in which contrasting patterns will look stylish and original. The bride, dressed in a white skirt and black bra, oron the contrary, it looks solemn, strict and unusual. Originally looks combination of different fabrics in the dress. 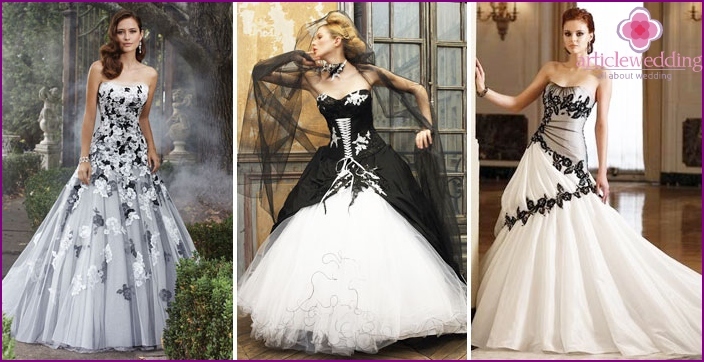 For example, a black full skirt can be dark tulle and lace corset made of white material. Great opportunities for visual correction provide the model with a contrasting top and bottom. Combining a black skirt and white corset helps to visually reduce the volume of the thighs, and the opposite combination is suitable for girls with a physique "apple". Wedding in black and white above the knee-long dressIt can become fashionable and ideal for brides who have a beautiful figure and shapely legs. Short Skirt will make the image of the bride ease, naturalness, Romanticism. White outfit can effectively decorate a black belt or ribbon, the black color print with flowers or other designs. 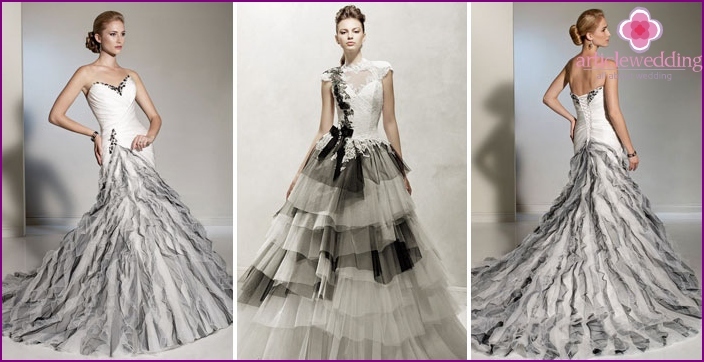 Beautiful lush flounces or small ruffles with contrasting trim will add brilliance, elegance in the image of the bride. Models Suite with asymmetrical brimwill help to hide a lot of flaws in the figure. And if to make them use a black and white fabric or light fabric trim a contrasting color, the girl every body will look irresistible, perfectly in them. Asymmetry of skirts, sleeves, neckline, diversified one oblique connection loci fabrics - all this is used to create the original wedding dresses. Fashion trends in wedding fashion isthe use of an asymmetric arrangement of drawings, prints on clothes. Contrasting white and dark blocks are perfectly combined in the wedding models. Asymmetrical cut on one shoulder looks good in black and white shade. Oblique bodice can be supplemented with a flounce, drapery, contrasting inserts. Interestingly looks black and white wedding dress, the skirt is long back and short in the front. Black and white accessories will make the image of the brideharmonious, complete, add special charm to it. Bouquet of the bride in the best contrast palette to draw from artificial flowers. If, however, you essentially that during the celebrations in your hands were fresh flowers, then give preference to white bouquet of roses or peonies. Coal shade gloves, veil, veil, hatemphasize the individuality of the bride and will be perfectly combined with contrasting colors on the clothing. Under this outfit suit black and white shoes and white shoes. Wedding make-up is best done with an emphasis on the eyes. You can use the classic make-up with black arrows. Manicure in soft white colors perfect for a black and white clothes, and contrasting colors in accessories for the perfect hairstyle to the general style of the bride. Prejudices about the appropriateness of black forBride image fading. This opens space designers to implement their boldest ideas in their collections. White wedding pattern with black print, belt, bow Woman make unique, beautiful. A combination of contrasting colors bottom and top will help hide the flaws of the girls figure. See a selection of photos, which confirms the presence of similar trends in the third millennium.